Amid huge ratings declines, ESPN execs have decided to move First Take from ESPN2 to ESPN beginning in 2017, reports John Ourand. It will still occupy its 10:00 a.m.–12:00 p.m. ET time slot, meaning the 10:00 a.m. SportsCenter hosted by Hannah Storm and the 11:00 a.m. SportsCenter hosted by David Lloyd and Cari Champion will both move over to ESPN2. It didn’t take a crystal ball to see this coming, and indeed there has been reporting that ESPN execs were considering such a move. First Take’s ratings immediately fell by about a quarter when Skip Bayless left ESPN in June, and since Labor Day—and the launch of Bayless’s Second Take on FS1—they’re down by over a third. Tuesday was First Take’s second lowest watched show of the year, and it only beat Second Take by 87,000 viewers. A move to the more-watched network should give First Take a boost. 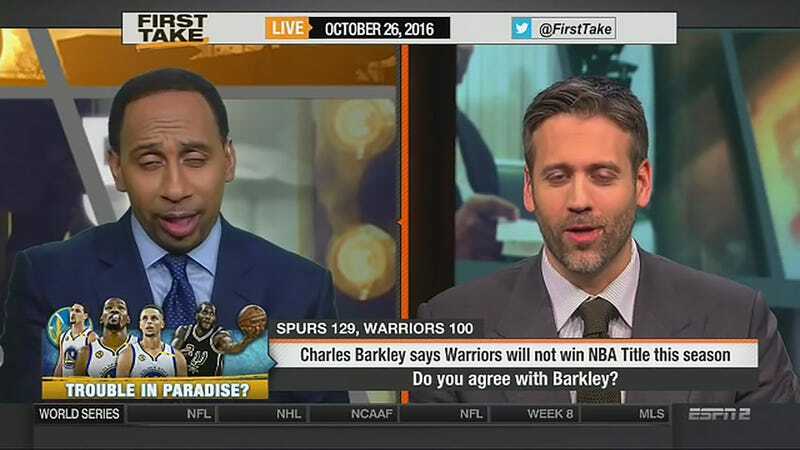 First Take isn’t the only sports debate show suffering. Combined, First Take and Second Take’s audience doesn’t match what First Take pulled in last year, and the ratings for ESPN’s afternoon block of Around the Horn and Pardon the Interruption are down as well. Like the most commonly given explanation for the NFL’s ratings decline, it could just be the election, or perhaps we are finally past the peak of sports opinion shows.